Family companies – where founders or descendants hold at least 20% in direct shares or where voting rights held by the founders or descendants is at least 20% – continue to generate stronger top-line growth than their non-family peers. The report notes that the revenue growth premium appears relatively robust across all the main regions. This clearly lays the foundation for superior overall financial performance, which in turn supports strong share-price appreciation as well. In addition to higher top-line growth, we find that family- or founder-owned companies also generate better profitability. The balance sheets of family companies are typically less leveraged. This inherent risk aversion remains the case in our latest data. This of course provided a degree of insulation in the financial crisis. They also showed themselves able to reduce leverage much more quickly during the early years after the crisis. The combination of better top-line growth, higher margins, and reduced reliance on external funding for this growth suggests that family companies might also be generating better cash flow returns. Our analysis indeed suggests that this is the case. Michael O'Sullivan, Investment Solutions and Products, and Eugène Klerk, Global Markets Equity Research, discuss the report. It seems this superior profitability, conservative financial structure, and creditworthiness have been typically rewarded with higher equity valuation. Family companies have historically tended to trade at a valuation premium compared to their non-family peers. The key question, however, remains why family- and founder-owned companies generate these better financial metrics, which in turn allow them to outperform broader markets. Last year's study alluded to the longer time horizon that family companies adopt in their decision-making. This was borne out in the proprietary survey we conducted of a sample of companies from our universe. A greater focus on R&D was a notable feature. Capex as a percentage of depreciation: A company that invests less than its annual depreciation charge is, all else being equal, clearly not developing its asset base as much for the longer term as companies that spend more than depreciation. The data suggest that family-owned companies across all key regions do spend more than their annual depreciation on capex and that this ratio is also higher than spending by non-family-owned companies. Growth of gross investment: Companies with a greater focus on long-term development are also likely to have overall higher investment intensity toward their asset base. Historical data for our family and non-family companies suggest that the former do indeed show stronger growth in gross investment. R&D as a percentage of revenues: Research and Development expenditures are by default long-term in nature. We would argue that a greater level of spending at least indicates that the company's management has a longer-term focus. 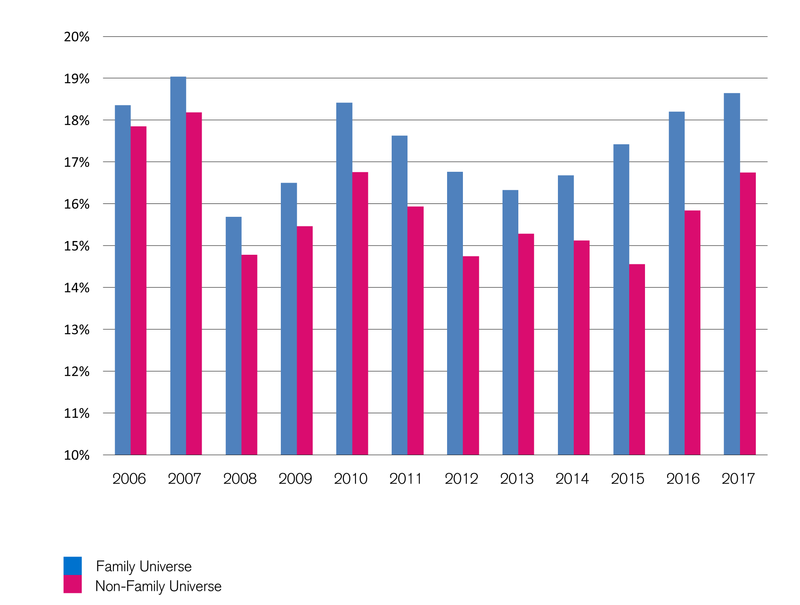 The data for our family-owned universe suggest that in the USA and Non-Japan Asia, family companies indeed spend more of their revenues on R&D. Buy-backs as a percentage of cash flow: Companies that focus on long-term growth are more likely to reinvest internally generated cash flows into their operations rather than use cash for buy-backs or dividends. The data that we have for our universe clearly show that family-owned companies across the key regions do indeed spend less of their cash flows on buy-backs. Our calculations for each of the "long-term-focus" categories clearly suggest that family companies do have a longer-term investment philosophy. Having a longer-term investment focus provides companies with the flexibility to move away from the quarter-to-quarter earnings calendar and instead focus on through-cycle growth, margins, and returns. This also allows for a smoother cash-flow profile, thereby lowering the need for external funding. 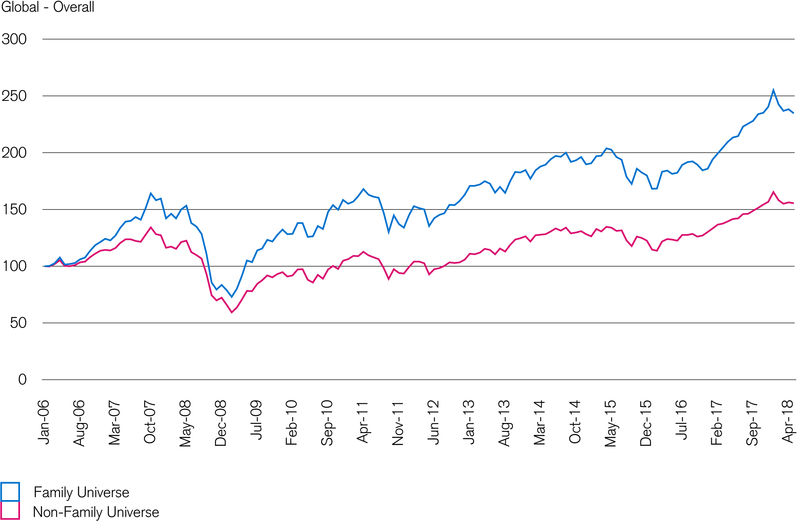 In turn, all of this has supported the share-price outperformance of family-owned companies since 2006. This report (PDF) was published in September 2018 and is the second edition: It reconfirms last year's conclusion that family-owned businesses tend to outperform broader equity markets based on a database of 1,015 family-owned companies. The report delves into the reasons why this is the case. There is also a review of governance structures and their impact on performance. The report also analyses periods where family-owned businesses underperformed in the last 12 years, as well as a regional breakdown for EMEA, APAC, and North America. • Voting rights held by the founders or descendants is at least 20%.